In 2014 Buck celebrates the 50th Anniversary of the 110 Folding Hunter. As we celebrate this iconic anniversary, all 110’s manufactured in 2014 will have the “1964 50 years” emblem on the knife handle. This is the original folding lockback; large enough for any chore, but small enough when folded for belt or pocket carry. Clip point blade with brass bolsters and a natural wood handle. 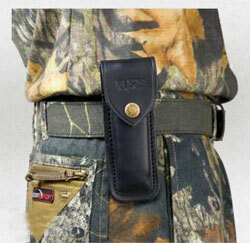 Includes Genuine leather sheath and Buck’s 4-Ever warranty. The 110 Folding Hunter–Buck’s signature knife–originally debuted in 1962, making it a good year for knife safety. The Folding Hunter is equipped with a nail-notch lockback design that opens easily and closes safely during any activity, ensuring that the knife never goes out of style. The knife’s 3-3/4-inch stainless-steel clip blade, meanwhile, is ideal for detail work, such as piercing and cutting in tight places. And users will love the natural wood-grain handles and polished brass bolsters, which add a classic touch to the design. The Folding Hunter, which comes with a black leather sheath for easy carrying, is backed by Buck’s 4-Ever unconditional lifetime warranty. The Folding Hunter comes with a black leather sheath for easy carrying.